HALIFAX - Two of Canada's leading marine biologists and a conservation group say a five-year proposal to slaughter 140,000 grey seals in the southern Gulf of St. Lawrence is being driven by politics, not science. "I don't support it," said Hal Whitehead, a professor at Dalhousie University in Halifax who specializes in the study of whales. "From what I've seen of the rationale, it doesn't make much sense to me." Earlier this month, a federal advisory panel urged Fisheries Minister Keith Ashfield to approve the cull, which would result in the killing of 70 per cent of the grey seals that feed in an area that stretches from Quebec's Gaspe Peninsula to the east side of Cape Breton. The Fisheries Resource Conservation Council, made up of scientists and fishing industry representatives appointed by the minister, said the proposed cull is an experiment that will test indirect scientific evidence suggesting grey seals are impeding the recovery of cod stocks. Whitehead said the council's description of the project as an experiment is laughable. "There's no control group," he said in an interview, referring to the unaltered group in a scientific experiment that allows for comparison of results. "In this case, there's just one lot and you're killing a large part of them. If the cod population goes up, it doesn't necessarily mean the seals were to blame. ... Disentangling relationships in the ocean is really tough." The professor also said that even though other predators eat cod, including some species of whales, the federal government seems intent on taking aim at seals to appease the fishing industry. "In this part of the world ... a substantial part of the population really dislikes seals," Whitehead said. "Before humans started industrial fishing, there were large populations of seals and of cod. Clearly, they can coexist perfectly well. ... It appears to me that politicians are playing into this largely irrational hatred of seals to make it look like they're doing something." Federal scientists say the southern Gulf cod population is at the lowest recorded level and is declining even though large-scale commercial cod fishing has been suspended since 1993. Boris Worm, a Dalhousie biology professor who studies marine biodiversity, said former fisheries minister Gail Shea had said a cull was a good idea in 2009, and federal scientists have since been pushed to justify that decision. "It was something that was announced before the science was heard, and then a meeting was convened to produce the science to support that decision," he said, referring to a series of scientific workshops held last fall. "To me, as a scientist, that's not acceptable." A call to Ashfield's office in Ottawa was not returned. Wayne Stobo, a retired researcher with the federal Fisheries Department, said his extensive fieldwork with grey seals has led him to the conclusion that the proposed cull is worth a try. While he doesn't disagree with the professors' arguments, he insisted that experiments don't need control groups to be valid. "The nature of an experiment is that you try something and see what the result is," he said, adding that scientists didn't need a control group to conclude that the collapse of the cod stocks in the early 1990s was largely due to overfishing. "There's a little bit of scientific game playing here. ... For them to turn around and say it's not an experiment is a bit disingenuous." Stobo spent about 13 years tracking the grey seal population on Sable Island, where he found the herd was growing rapidly at 12 per cent per year. The Fisheries Department says there are now up to 410,000 grey seals living off the Atlantic coast — a 30-fold increase since the 1960s. A majority of them live part time on the island, a spit of land about 160 kilometres southeast of Nova Scotia. "They're going to be eating more cod when the population is 30 times higher than before," said Stobo. "That's simple math. Nobody has to be a scientist to figure that one out." 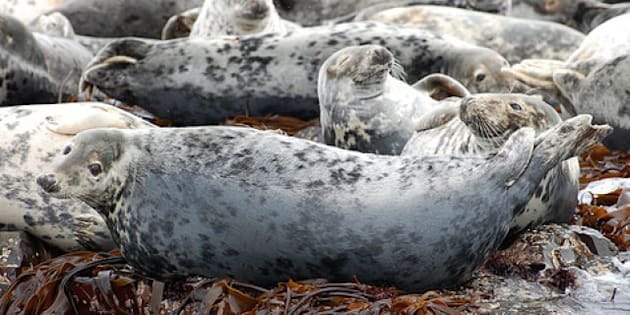 Debbie MacKenzie, chairwoman of the Halifax-based Grey Seal Conservation Society, said the notion that a growing population of grey seals is eating too many cod is too simplistic. She said the council's approach ignores the fact that the seals are part of a complex ecosystem — and that removing them could have unexpected consequences. While grey seals do eat a considerable amount of fish, MacKenzie said, they also expel enough nitrogen to encourage the growth of algae, a key source of food for the most basic life forms in the ocean, including plankton. "The assumption is that there will be absolutely no harm from their experiment. ... But what you can hurt is what's dependent on the grey seals," she said. "This is an experiment in manipulating decision makers by using only part of the information available. ... It's obscene."